In June 2016, a salvage excavation was conducted on the eastern hills of Moshav Sheqef (Permit No. A-7725; map ref. 19398–464/60182–245; Fig. 1) prior to construction work. The excavation, undertaken on behalf of the Israel Antiquities Authority and financed by Lachish Regional Council, was directed by D. Eisenberg-Degen, with the assistance of Y. Al-‘Amor (administration), M. Kahan (surveying and drafting) and I. Delerson (plans). A structure, a winepress, field walls, cupmarks and basins were discovered in the chalk hills of the Judean Shephelah, together with a few abraded and thickly encrusted potsherds. 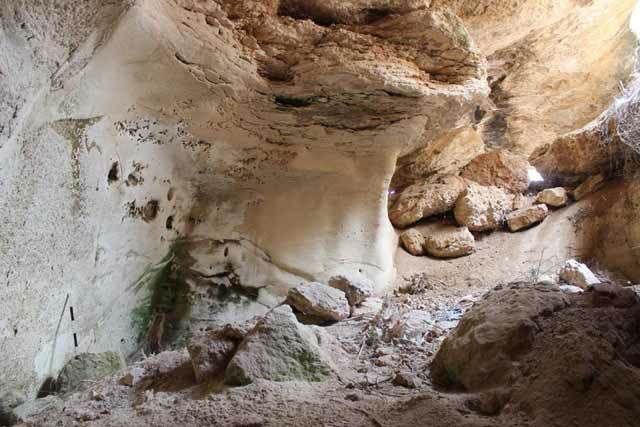 In addition, a cave was documented but not excavated due to safety concerns. Many of the hill slopes in the region were adapted as farmland using field walls. The hills are of chalk rock, which is well-suited for quarrying caves and reservoirs, and is covered by an upper layer of nari rock, which is suitable for hewing installations. About 200 m south of the excavation area, at Har Nadal, lies the site of Rujm el-Handhal, where remains from the Intermediate Bronze Age, Iron Age II, and the Persian, Hellenistic, Roman, Byzantine, Mamluk, and Ottoman periods have been found in the past (Dagan 2006: Site 548). 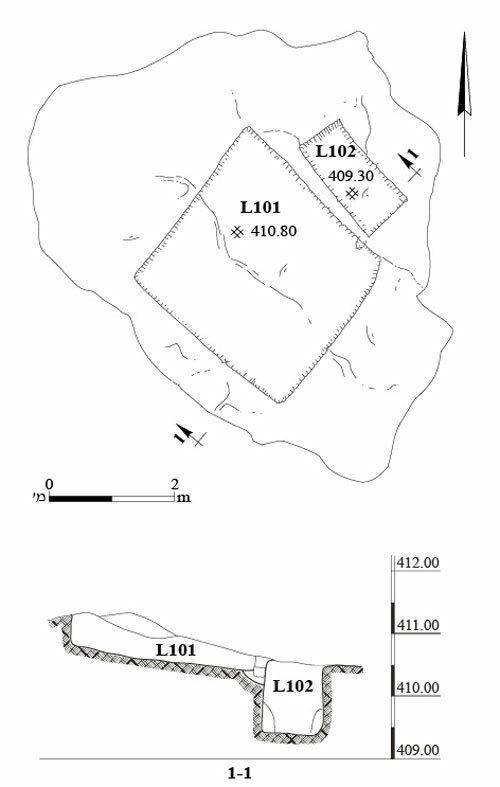 The excavation area was included in the Amazya Survey and was recently surveyed prior to development in the area (Lender 2012; Permit No. S-629/2016). Inspections following the excavation recovered potsherds from the Persian period near the entrance to the documented cave (A. Peretz, pers. comm.) as well as a winepress (map ref. 194269/602273; H. Mamalya, pers. comm.). Building (Figs. 2, 3).The walls (W1–W4) of the building—one or two courses of large fieldstones laid in dry construction—were founded at different levels. Wall 2 is longer than the other walls and appears to have originally been a fieldwall constructed at an earlier date. A few small, non-diagnostic potsherds and small and medium-sized fieldstones were discovered in the building; they were probably cleared from the nearby fields after the building was abandoned. Winepress (Figs. 4, 5). 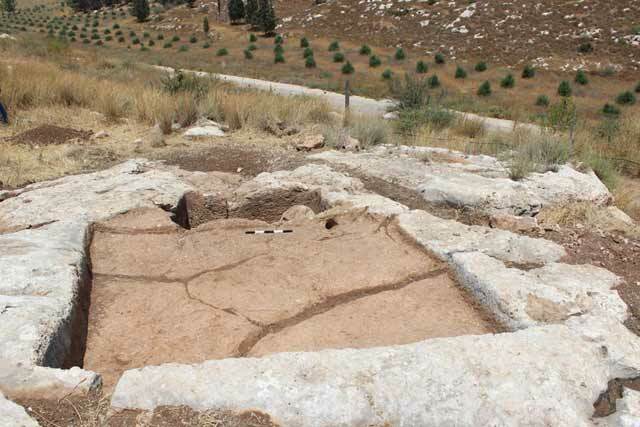 A rock-hewn winepress with a treading floor (L101) and a collecting vat (L102), connected by a channel, were discovered down a hill slope. The treading floor had several deep cracks formed by ground movement that occurred after the winepress ceased to be used. Field Walls (Fig. 6). Three walls (W5–W7) were found. Wall 6 runs parallel to W5 and c. 3 m further down the slope. Walls 6 and 7 form a corner and probably delimited an agricultural plot (L116). Wall 5, which was well preserved, can indicate how the other, poorly preserved walls were built. It was built of two courses of large and medium-sized fieldstones set in a row. Most of the stones of Walls 6 and 7 were not found in their original location. Wall 7 was built along the slope, and by comparing it with other, similarly built field walls in the area, it seems that its stones were laid on their narrow and wide sides alternately. One of the collapsed stones of W6 had drafted margins (a column base? ); it was probably brought from the nearby site of Rujm el-Handhal. Cupmarks and Basins (Figs. 7, 8). 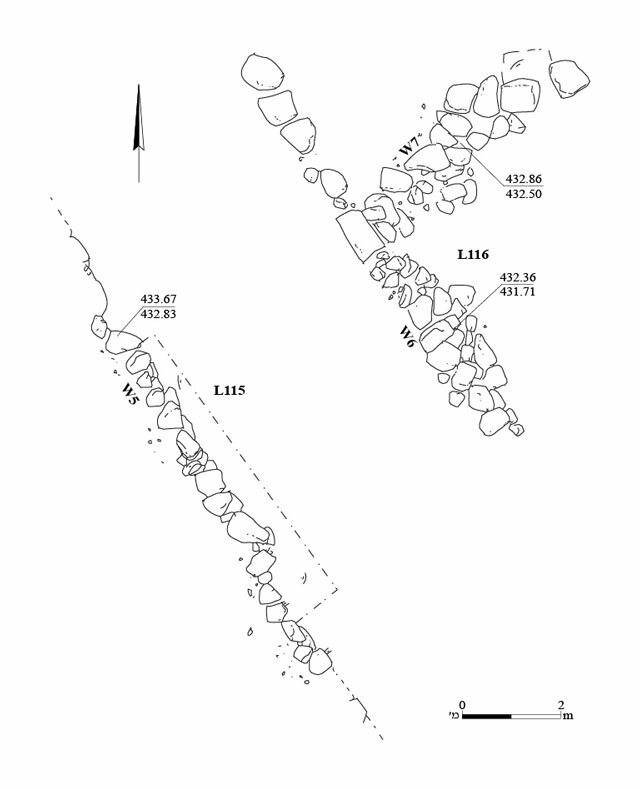 Nine cupmarks and basins were found hewn in six rocks outcrops (Table 1). Basins 106–108 may be natural and unhewn. 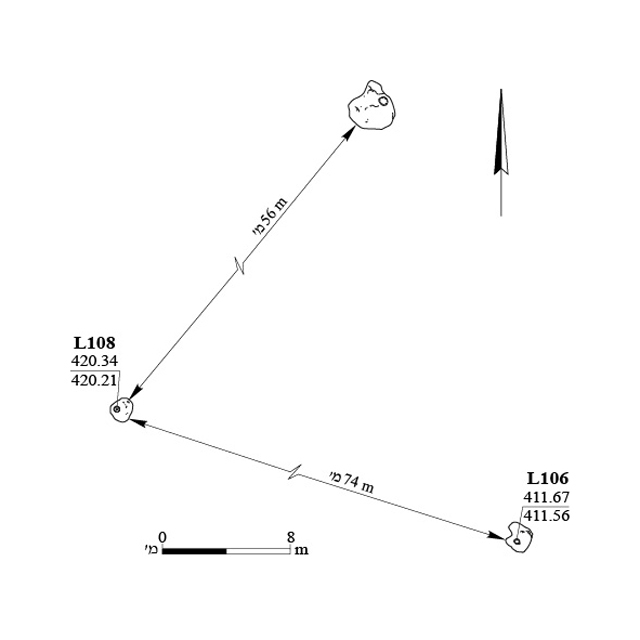 Basins 109–111 were cut into a single rock and were connected by a channel. A depression (depth 5 cm) that may have had a channel leading to it was found at the bottom of Cupmark 112. Cupmarks 113 and 114 were hewn in a single rock. Cave (Fig. 9). The rock-hewn cave comprises two interconnected chambers. The outer chamber is rectangular and has a partially preserved arched roof. It contained large rocks that had probably collapsed from the ceiling. Shallow niches were cut into the western wall, near the northern corner; one was surrounded by an engraved line marking the contour of what seemed like a columbarium niche. The cave appears to have served as a water reservoir before an attempt was made to turn it into a columbarium, but this was attempt abandoned at an early stage. The structure and installations discovered in the excavation can be added to the long list of similar remains that served in agricultural activity in the region (Dagan 2006). 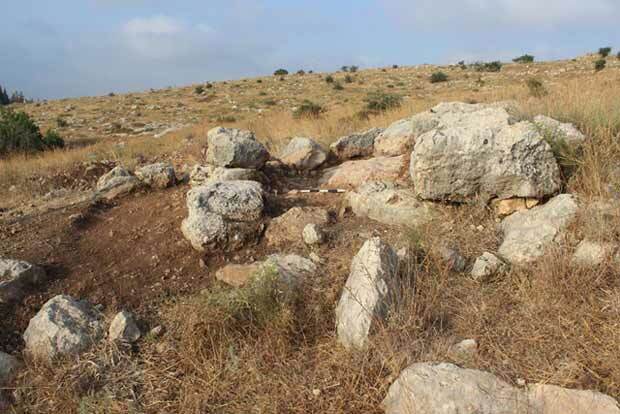 The unearthed structure resembles previously discovered field towers (Ganor 2016), and like those unearthed in Benei Deqalim (Lifshits 2017) and Betar ‘Illit (Peleg and Feller 2004) it was found filled with fieldstones. Iron Age 2 potsherds found inside the towers may suggest that this is the date of the structure. The winepress is one of dozens recorded around Moshav Sheqef (Paran and Aladjem 2007) and one of thousands documented in the Judean Shephelah (Dagan 2006). 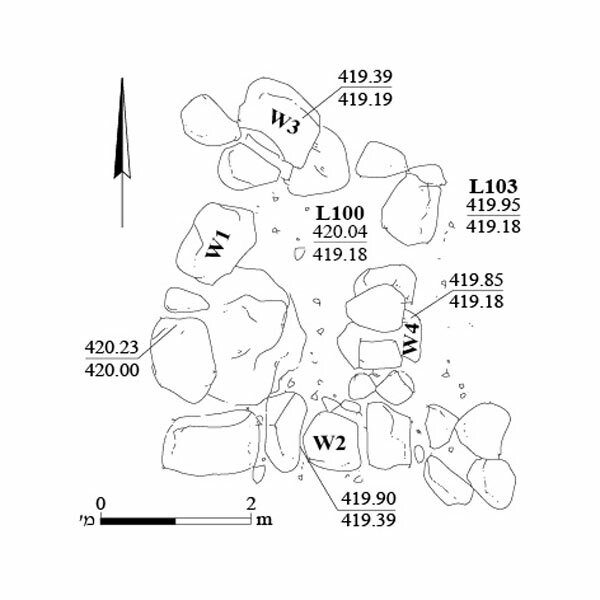 The stone with drafted margins found among the collapsed stones of the field wall is a common find, indicative of the widespread phenomenon of secondary use of building stones in the construction of field walls (Dagan 2006). 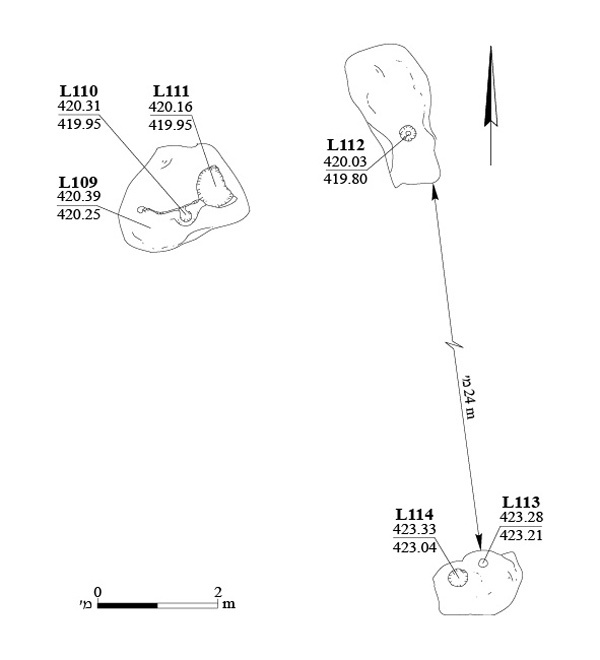 No datable finds were discovered in the excavation, but find from a past survey of the region show that it was farmed mainly in the Late Roman and Byzantine periods (Dagan 2006). Dagan Y. 2006. 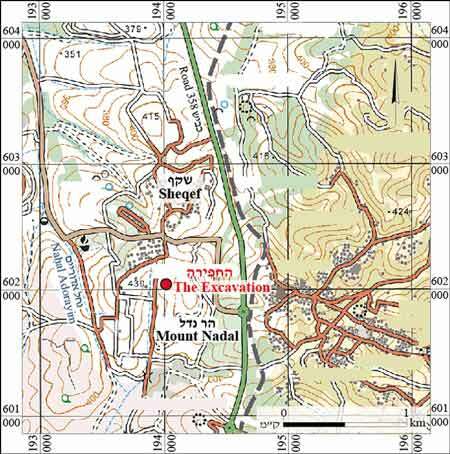 Map of Amaziya (109) 2: The Southern Sector (Archaeological Survey of Israel). Jerusalem. Ganor S. 2016. Fortresses, Forts and Towers in the Jerusalem Region during the Iron Age IIb-IIc Period. In Ganor S., Kreimerman A., K. Streit and M. Mumcuoglu, eds. From Sha’ar Hagolan to Shaaraim:Essays in Honor of Prof. Yosef Garfinkel. Jerusalem. Pp. 81–102. Lifshits V. 2017. Benei Deqalim. HA-ESI 129. Lender Y. 2012. Sheqef, Survey. HA-ESI 124. Paran N.S. and Aladjem E. 2007. Khirbat Beit ‘Awwa HA-ESI 119. Peleg Y. and Feller Y. 2004. Betar ‘Illit (West). HA-ESI 116. 4. Winepress, plan and section.